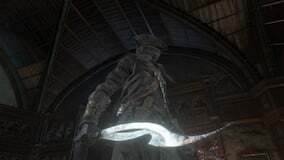 Blade of Mercy is a Trick Weapon in Bloodborne; it's one of two skill/arcane hybrid weapons. 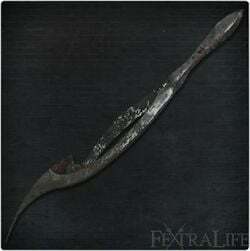 "A special trick weapon passed down among hunters of hunters. One of the oldest weapons of the workshop. Splits into two when activated. The weapon's warped blades are forged with siderite, a rare mineral of the heavens. Most effective swift attacks,such as after a quick-stepping." This is one of two skill-based weapons in Bloodborne that has direct scaling with arcane for damage output. Can be purchased from the Messengers for 40000 echoes after obtaining the Crow Hunter Badge from Eileen the Crow's quest line. 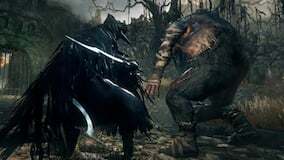 Killing Eileen is also a way to get the weapon early in the game. While progressing through Eileen's quest, it's possible for her to be killed by Henryk and thus drop the Crow Hunter Badge as a result, although the quest line will end. Rotted Fetid Lower Loran ( 2erutqky ) - Inside cask in loot area before 1st boss after opening gate. Sinister Lower Loran Root Chalice Glyph: v77hfp2e, layer 1 side area before boss. The normal form of this weapon is a curved sword with a standard and versatile move set. Very standard. Despite what its small size may imply, it deals decent damage per attack in addition to having fast swings. As such, it has a higher than average DPS but suffers extremely short range in the mean time. On the flip side, the transformed mode utilizes dual mini-curved swords that have a faster attack speed; this comes at the cost of disabling a normal left-handed weapon and less damage per individual strike. R1 attacks in the transformed form slowly speed up as you continue attacking, capping after the fifth strike. In PVP, if you believe you can win a battle of attrition, it can be used to bait an opponent into overextending a skirmish, especially if the opponent is unaware of the wind up attack speed. Be careful not to spam this tactic; smart opponents will unleash visceral attacks if they realize what you're trying to accomplish. Appropriately enough, this is good for fighting most NPC hunters, though. If you can get in close and get their back to a wall, you can stab them until your stamina runs out since they'll flinch with about every hit and be unable to retaliate. Just remember to leave them no space to backstep away; they'll be able to do it that way. Practice it a bit, then get in there and get an early start on the sky burial the next time you're fighting an NPC hunter. The Blade of Mercy is best suited for fighting individual targets rather than a group due to its move set; this is due to the weapon's kit favouring sidestep thrusts and quicksteps that are difficult to retaliate against in a battle of speed when your opponent is alone. Rally is somewhat low due to the weapon's fast attack speed. Combos with this weapon can potentially alleviate this issue, but take care not to exhaust your stamina in the process. Disengage at low stamina with a backwards dodge or an L2. This weapon lacks the ability to do a charged R2 attack in transformed mode but has a 2 R2 combo. Due to its fast attack speed, it can be useful for inflicting Rapid or Slow Poison. L2 attacks in the transformed mode causes the hunter to attack and hop backwards simultaneously. This is useful as a defensive mechanism since it grants you breathing room from your opponent. It's also useful as a finisher to any combos you unleash on an opponent, dealing considerably high damage and distancing yourself so that you can recover stamina. Make sure you are directly in their face for this, as it has one of the lowest ranges in the game. 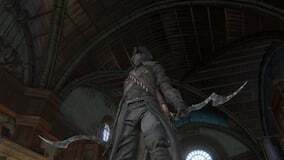 Think like a rogue/assassin/thief from a traditional RPG when using this weapon. You will typically not win battles by brute force, but rather through speed, patience, positioning and dedication. The blade lacks decent heavy attacks to stun heavier foes but the transformation attacks can be used as heavy attacks. This weapon has many similarities to the Burial Blade. Moveset testing done by - Castielle. Numbers were tested on a level 120 player with no armor using a +10 Blade of Mercy. R1 Combo 1.00x, 1.02x, 1.04x 15 There are three moves in the combo consisting of horizontal slashes. The first is right to left followed by left to right with the third being right to left with a slight upward motion as well. The even attacks (2, 4, 6) are all the left to right slash. All right to left slashes (odd numbers) except the first use the motion that includes the slight upward trajectory. This has very little stamina cost and can create very long combos. In addition, since all of the attacks are basically the same, pacing and consistency make this an easy combo to utilize. Quickstep R1 1.50x 25 There are three quickstep animations. Stepping right or back creates a quick forward hop and slash from right to left. The left step is reversed with the slash animation. Stepping forward leads the character to drag the blade from the ground to the side of the left foot and up on a diagonal, ending at about shoulder height. The front step is the only one that doesn't have a hop forward, instead taking only a short step. Backstep R1 1.50x 25 The backstep R1 has a quick forward lunge which includes a horizontal slash from left to right. Rolling R1 1.50x 25 The blade is quickly slashed from the ground near the left foot, up and to the right ending at just above shoulder height. Dash R1 1.40x 15? (+run) The hunter ends the run with a step and forward stabbing motion. R2 Attack 1.25x 30 The hunter reverses his grip on the blade and brings it behind his body, then quickly slashes forward right to left and returning the grasp to the standard position. Charged 2.00x 50 The charge starts off with the same grip change as the R2, but drags the weapon a little further behind the body. Instead of slashing from right to left horizontally, the blade is brought up in an uppercut motion ending above the head. Dash R2 1.80x 30 (+run) As the hunter runs, the blade is brought in front of the stomach while the body begins to rotate (right foot drifts behind the character). The hunter uses the momentum to lean forward while finishing the rotation of the body and slashing from left to right horizontally. Despite the short nature of the weapon, this move has a larger arc of attack and can be used to wade into a group of enemies and hit multiple foes. Leap 1.50x 35 The leap is fairly consistent with other weapons, with a jump forward and a downward diagonal slash from right to left. Transform Attack 1.20x 15 (+15) The first (backstep into transformation) has the hunter bring the weapon to the right hand side. As it's brought forward in what looks like a normal horizontal slash, the two daggers come apart. The blades appear to be magnetized and hold together at the tip, with the second blade whipping around the tip of the first in a circle. Meanwhile, the left hand has stored its weapon and catches the handle of the second weapon to go into the two hand stance. The second animation (following an attack) is similar to the first, except the blade starts at the left side of the body. The weapon is cast out and again the left hand dagger separates and whips out from the right hand dagger (connected by the tips) and comes back to the left hand. Fun fact: the standard transformation (not attacking) has the left hand stowing its weapon and simply grabbing the handle of the second dagger. Both hands raise up and separate the blades. A shower of sparks are created from the two tips unlocking which suggests this is where they're primarily joined. Numbers are rounded to the nearest 100th. R1 Combo 0.90x, 0.90x, 0.90x, 1.25x, 1.10x, 1.12x, 1.18x, 1.18x 12~ for first 3, then 15 each hit after A basic combo involving a flurry of attacks with both hands wielding the transformed blades. They are: Right hand downward diagonal right to left, left hand left to right horizontal, right hand uppercut slash, both hands from overhead slashing down and then out, right hand forward stab, left hand (with reverse grip, blade held down) slashing to the right and up, right hand mirroring the last move (reverse grip slash to left and up), left hand forward stab. At this point moves start to repeat (right hand stab, then left hand reverse grip slash). At the fifth attack (right hand stab), the combo speeds up dramatically. All attacks are mostly in front of the player making this best used for one on one combat. Quickstep R1 1.40x 30 All four quickstep animations are a rapid lunge forward with the hunter bringing both blades to the front in a thrusting motion. Backstep R1 1.40x 25 The hunter hops forward with the right hand knife near the stomach. It is drawn forward in a left to right slash. Rolling R1 1.40x 25 The hunter quickly stabs both blades directly in front at about abdominal level. Dash R1 1.40x 25 (+run) The hunter lunges onto the right foot and stabs forward at about stomach height. R2 Attack 1.50x, 1.60x 45 (follow up is 50) The R2 attack is actually a short (two hit) combo. The first has the hunter bring both blades to the side at about shoulder height and slash them both front and across (right blade ends on left side and left on right). The follow up attack has a quick hop forward and both blades are brought back out again (out and up symmetrically). The second attack slashes at about leg height. Backstep R2 1.70x 35 Both blades are brought to the low and into the body (across the stomach). The blades are both slashed outward, with the right hand moving out and up and the left hand moving out and down. Dash R2 1.70x 30 (+run) This is similar to the dash R2 of the other mode. The right hand is brought into the stomach as before while the hunter rotates in the same direction (right foot drifting behind). However, instead of simply leaning into the attack, the character does a short leap forward and slashes with both blades as the left catches up with the spin. Leap 1.50x 45 The hunter leaps forward, reverses the grip of both daggers and stabs them into the ground. L2 1.50x 45 The hunter raises both blades overhead and brings them down and out to the sides creating an "x." The character also hops backward. This move is well suited as a final strike following an R1 combo as it will set you away from your enemy after slicing. Transform Attack 1.30x 15 (+15) There are two animations that are functionally identical for this move. In every instance, the grip is reversed on both blades. They are brought overhead and rejoined and brought downward and to the side in a stabbing motion that ends at the hunter's side. Attacking prior to the transformation leads to a slash toward the right side of the body. An evasive action (quickstep, backstep, roll) will result in the stab heading to the left. The Blade of Mercy was originally named as "Warped Twinblades" during the Alpha test, and it was the tool of choice for the "agile" hunter. Both the Burial Blade and Blade of Mercy make mentions of a mineral known as siderite in their descriptions. is the real-life alternate name for an iron meteorite, and it seems to be the reason why arcane power has direct scaling with both blade's damage output. Due to its extraterrestrial origins, that may explain why it cannot be buffed by an external source of any sort. It loosely resembles the Eleum Loyce from Dark Souls 2, a sword with two blades at the front. Does anyone know if levelling up the Arcane attribute increases the bonus arcane damage or just the physical damage? Because so many people are dumb and think that Blades of Mercy are bad and that arcane scaling is worthless on them etc etc. I’d like to point out exactly why you take Arcane with these. You’ll be in transformed mode 99% of the time; they’re extremely close range... so, you get value out of the “spells” to compensate for your lack of range. NG+ you get to add in the burial blade to your setup. You also get to remain highly mobile, which is incredible. You’ll weave through enemies like a mad dancer, and then cast spells randomly. The kits wildly unpredictable and has probably the highest skill gap of any weapon in the game. Which makes it the best weapon in the game. Seeing so many claims of simply R1 spamming is the best way to use these, despite that being the truly worse way anyone could use these. As the description suggests, it is best to use ones dash attacks to weave in and out from the enemy in a hit and run style. Kinda a similar but more effective version of the Beasthunter Saif. The dashing L2 is by far it&apos;s most powerful attack, and it can be used multiple times with little risk of being hit if one dashes with good timing. Get to the back of the enemy and R1 stunlock them. No escape no surrender! The Blades have it pretty tough in this game. It&apos;ll never have the sheer DPS and ease of the Saws, and the Rakuyo offers a lot of the same idea but with more range and versatility. That&apos;s not to say they&apos;re bad though, the extremely low stamina cost could offer an interesting way to play the game for some people and I&apos;d imagine it must work well with a poison build. The key to using these things too is the sidestep or backstep attacks, they&apos;re fast, marginally better range than just R1&apos;ing it up, and surprisingly damaging. Thanks to those attacks and the low stamina consumption of the weapon overall I&apos;d be tempted to say it&apos;s one of the few weapons in the game that has great synergy with the hunter&apos;s bone. I made a straight Skill build that took Arcane up to 15 for the Bone, and also was one of the only builds I&apos;ve ever made where I bothered to take Endurance past 20, and it worked out quite well. Won&apos;t lie about it&apos;s shortcomings and the shadows of other weapons its kind of stuck in, but it has some tech to itself and they&apos;re a fun way to play the game. Challenging. Anyone know a 100% way to get uncanny? I’ve already made two ailing lower loran chalices and neither had the blade. If you perform a Dash R1 attack, but keep holding down on the circle button throughout the attack animation, you can actually perform another Dash R1 as soon as your character&apos;s legs start moving again without having to regain your momentum. You can do this with any weapon, but it works much better with the BoM on account of the low stamina cost, higher speed, swift attack bonus, and interruption bonus. Not sure if it&apos;s wise to use in PVP, but it works pretty well against larger, faster enemies and bosses. You can also change direction if you need to without losing momentum, or even perform a Dash R2 instead, but this costs more stamina and has a longer cool down. I can&apos;t put bolt paper on them is it a glitch? I&apos;ve just recently got this game and I have this blade and I dunno if I should keep using it? I&apos;m currently in the prison at level 28 and don&apos;t know if I should swap or not? And if so what should if swap too?? Literally wanted to kill myself while trying to get through Paarl with these. Theyre are so *****ing short its literally impossible to consistently hit the leg you want, on top of typical Paarl problems like him being another camera boss etc., AND the dmg output is so***** compared to ie. cleaver. these blades are gay, kirkhammer + summons all the way! but suffers extremely short range in the mean time? these articles need to quit being written in the group homes. It may not seem ideal for larger bosses like Cleric Beast or Vicar Amelia, but considering how quickly it can dish out successive attacks, I&apos;ve found it&apos;s a great weapon for breaking their limbs in succession to keep them from fighting back, allowing you to deal surprisingly severe combos. There&apos;s also a dash-L2 attack in transformed state that&apos;s not mentioned here. It&apos;s not that different from the usual L2, but I thought it deserved mentioning since it initiates with the hunter performing a power slide, lmao. Alright, who the ***** wrote the moveset descriptions for this page? Hm? Because in that section i&apos;m pretty sure you&apos;re supposed to be briefly describing the general attack animation, what the move is most useful for, properties like armor, invuln, projectiles, ect, not giving a three paragraph lecture on goddamn magnetism. All of that should be cleaned up and moved to Trivia. It&apos;s not gameplay-relevant. Do not bother putting anything into arcane for using this weapon or burial blade, it&apos;s not worth it at all. You get about +40 Arc damage at 99 Arcane. Just go for high skill and physical gems. At first glance, this weapon does seem to have a lot of glaring weaknesses... low per-hit damage, low stagger, low rally potential, low range. But when you transform it and get a good sidestep in against an enemy, damn does this thing do work. Sidestep + R1 is just fantastic, R1 combo utterly shreds anything that stays nearby, L2 is a great aggressive disengage, etc. I love it. Thought I&apos;d say that the blade kind of resembles an Egyptian sickle sword called a khopesh.